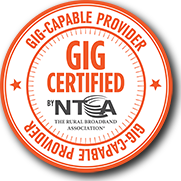 MTCO digiMAX Fiber Optic Internet Service Provider in Metamora, Germantown Hills, Marseilles, Washington, Illinois. Gigabit speeds available. NEW Gigabit Fiber Optic Internet packages now available! Details below. Bundle your Internet with TV and VOICE for more savings! Want MTCO to contact you with more details? Let us know here. digiMAX Fiber plans include modem / ONT; customer can choose digiMAX WiFi Service for $8/mo (router included) or provide their own 3rd party wireless router. Internet connection sharing set-up to multiple computers is not included; additional charges after first computer may apply. Other charges/equipment/restrictions may apply. Ethernet card required on PC/laptop/MAC to connect to Router. Actual speeds may vary and are not guaranteed. Please call 800-859-6826 for more details. 1 Terabyte (that's 1000 GB!) data plan included- Need more data? Click here for data plans FAQ and details.